So this will be a fairly long entry because it is the first time I'm making a daily journal-type post. Up 'till now I have only been posting the Picturecrossing pictures and a few of the ideas I've had, but I've been thinking for a while about just going ahead and making this a regular blog and post entries about the cameras I buy or other Polaroid related things that happen on a day to day basis because it really does seem to be taking over my life. Today I stopped at the Salvation Army Thrift Store on Ridge Road in Port Richey and saw three Polaroids there for sale at like $2.99 each but I already had several of each of them so I didn't buy them. (OneStep Close-Up, Sun 600 LMS, and a One Step Flash- I think). But while I was browsing them you won't believe what happened... I saw a girl walking by who had a Polaroid Camera tattoo on the back of her arm. Of course I had to talk to her and find out about the tats. Her name was Stephanie Powell and she is a fashion designer in LA who was home for Christmas. She told me she is always shooting Polaroids, that's why she chose to get the tats. I'll be photographing her tomorrow morning before she goes back to LA so I plan to load the photos on my next post. 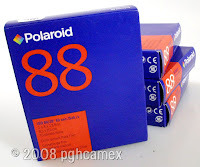 While I was shopping there I bid on and won some Polaroid Type 88 film I'd been watching on eBay (using my iPhone). Four boxes for $45.00 + $10.oo shipping making them about $13.75 each. It expired in 2005 but I'm really loving the square format peel apart cameras like my red Electric Zip. Next stop for the day was at Goodwill on US 19 in Port Richey. 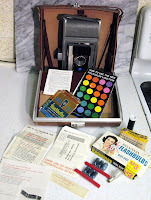 The first thing I saw there was a Colorpack IV (1969-1971), which I don't have, in the case with a bunch of extras, but it was priced at like $15.00 and it was not in very good shape with some serious corrosion on the batteries. 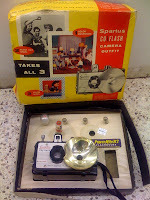 Then I saw this cool little "Spartus" camera in the original box. But what I almost missed in the same case with it was one of those old light brown leather Polaroid cases which contained a really nice Model J66 in the original case with a bunch of flash bulbs and documentation for just $10. It was in really great shape or I wouldn't have bought it because it takes the old roll film which of course is not available in usable condition, making this camera just a nice addition to the collection I have now decided to put on top of my book shelves. When I got home I was feeling great about my purchases and finally got brave enough to try out the new Holgaroid camera I'd purchased, especially since I just won 4 more boxes of film that can be used in it. So I took out a box of my Polaroid Viva film (color ISO 125), that I'd paid about $22.00 a pack for a few weeks ago. 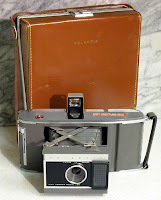 I'd found a great deal on Craig's List of a Holga 120 SF camera with a Polaroid back for Type 80 film AND 5 boxes of Polaroid 85 Positive/Negative film (ISO 80). Got all this for $110 including shipping, back a few weeks ago. So I loaded up a pack of Viva and took my wife Linda outside to test it out. My first try (on the left), setting the lens to the closest setting (head & shoulders) was pretty blurry so I got a bit closer - about 3.5 feet now and the result was a bit better but still blurry. 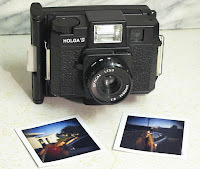 I have heard that some kind of adapter lens is supposed to be used when using the Polaroid back but I don't seem to have one so perhaps that is why it is still not in focus. If you know anything about this please contact me so I can figure it out. The exposures were not too bad in bright sunlight so I think this will be quite challenging, but fun!